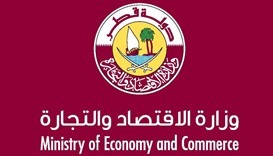 The ministry said it issued the decision to close the company, after it was found to be operating in violation of one of the articles of the Consumer Protection Law. 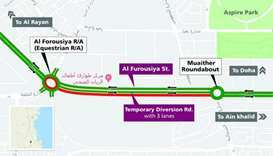 Ashghal will close part of Al Furousiya Street in the three lanes leading from Muaither Intersection to Al Manaseer Intersection, starting from Saturday (June 2) for two and a half months. HE the Prime Minister and Interior Minister Sheikh Abdullah bin Nasser bin Khalifa al-Thani touring the new Muaither and Al Wajba Health and Wellness Centres after inaugurating them on Monday morning. 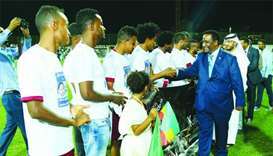 The event opened with a march past of the football teams who played the finals of the tournament held in connection with the community day. 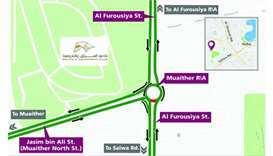 The closure is aimed at partial opening of the newly built Muaither Intersection to traffic on Sunday morning (May 6). 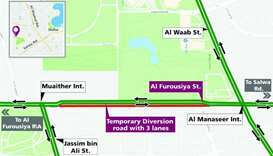 During the period, traffic will be diverted to three lanes parallel to the closed section of Al Furousiya Street. 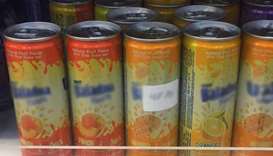 The Ministry of Economy and Commerce (MEC) has carried out surprise inspection campaigns targeting food shops in the Muaither area to monitor the compliance of retail outlets with intellectual property rights laws and regulations. 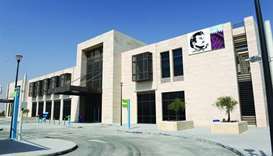 The construction of Muaither Centre for Health and Wellness, a state-of-the-art four-level complex, has been completed and is in the process of being handed over to the country's health authorities. 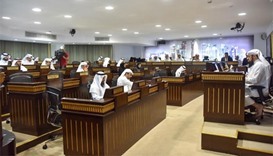 More yards for sale of Qatari agriculture products should be introduced throughout the country, it was suggested at the biweekly session of the Central Municipal Council (CMC) on Tuesday. 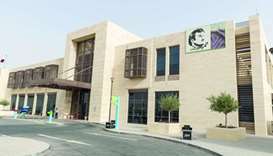 HE the Prime Minister and Interior Minister Sheikh Abdullah bin Nasser bin Khalifa al-Thani inaugurated the enhanced facility of the Bone and Joint Centre at the Old Salata area and the Enaya Continuing Care Centre in Muaither.